Beasts Made of Night kicks off on quite an exciting note. I invite you to picture the scene: two young men, poised to take on another "sin eating" job, and after a rollicking battle with the sin beast in question, our main character Taj puts the smackdown on it and starts chowing down. He eventually walks away from that terrible gig (which, in hindsight, all sin eating is terrible and thus, no sin eating gig is not terrible) with the promise of a few bucks and a brand new sin tattoo on his body. That's right, folks. In this terrible city readers will come to know as Kos, people's sins can sometimes manifest into terrible shadow creatures that only aki, a special breed of powerful individuals, can slay and absorb. Not only do these guys absorb the actual creature; they also absorb the guilt and the weight of that sin. So, was it a good book and worth all the hype it’s been getting? I would say yes. Do I want to absolutely know what happens next? For sure! Is it on my top shelf (aka books I will keep rereading until I am old and gray)? Probably not. Not for a lack of imagery or even rich world-building because this book has that in spades. Not for lack of great characters (Taj is a badass). I even didn’t mind the bit of court intrigue that plays a part in this story, and I'm normally not a court intrigue kind of guy. But somehow, even amidst the lush and rich storytelling, Taj’s journey as a character didn’t strike any epic bells with me. Boils down to taste, I think, because objectively, it’s a very well-crafted hero’s journey. It’s got all the beats, all the components; it's even got some crazy twists and a lead-in to what I can only hope is a second book. It would definitely make for some really good shounen anime, especially given the highly visual nature of the story and how vibrant Tochi Onyebuchi’s world actually is. 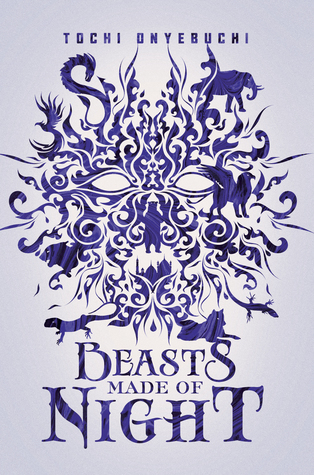 Action packed, marginally well-paced and brilliantly written, Beasts Made of Night is definitely one of my most enjoyable 2017 reads.